Douglas Dedo, MD earned his medical degree from the Northwestern University School of Medicine in 1969. He then completed his general surgery residency at St. Luke’s Hospital in St. Louis, followed by his residency in Otolaryngology at Washington University’s Barnes Hospital. During his residency, he trained in facial plastic and cosmetic surgery. Dr. Dedo is triple board-certified by the American Board of Otolaryngology, American Board of Cosmetic Surgery, and the American Board of Facial Plastic and Reconstructive Surgery. Dr. Dedo is a member of the American Academy of Otolaryngology – Head and Neck Surgery, American Academy of Facial Plastic and Reconstructive Surgery, and the American Academy of Cosmetic Surgery. 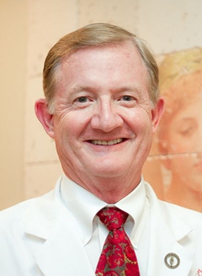 Having earned the respect of his peers, Dr. Dedo was elected as president of both the American Academy of Cosmetic Surgery and the Palm Beach County Medical Society. Dr. Dedo is an innovator in the field of liposuction surgery and facial plastic surgery. Drawing from his knowledge and experience with liposuction, Dr. Dedo developed a safe and effective alternative to gastric bypass surgery, called Sequential Liposuction and Body Sculpting or S.L.A.B.S. Consultations with Dr. Dedo are always free of charge! Consultations not only inform patients, but inspire them with sense of possibility for a life-changing procedure. At New Radiance we pride ourselves on realistically representing our services. We have Top doctors including plastic surgeon Dr. Douglas Dedo and renowned Liposuction expert Dr. Neil C. Goodman, who has performed over 5,500 procedures. Please note that even though you receive the best care and we have the latest procedures, your results may vary. Your own experience may not match the Before & After pictures and each individual's results will vary. The information provided is NOT intended as medical advice and is for your general knowledge only. © 2019 New Radiance Cosmetic Center Wellington.